• In Senegal, the abortion law is both restrictive and unclear. Although the country’s criminal code completely prohibits pregnancy termination, the code of medical ethics allows an abortion if three doctors testify that the procedure is necessary to save a pregnant woman’s life. • Contraceptive use remains low in Senegal. In 2014, only 20% of married women were using a modern contraceptive method, an increase from 16% in 2012 and 10% in 2005. Likewise, only 25% of sexually active unmarried Senegalese women were using a modern method of contraception. • Twenty-five percent of married women in Senegal have an unmet need for family planning—that is, they want to space their births or stop childbearing, but are not using any method of contraception. • Currently, some 31% of pregnancies in Senegal are unintended. • On average, Senegalese women give birth to two more children than they wish to have (5.0 vs. 3.2 in 2011). • An estimated 24% of all unintended pregnancies end in induced abortions; 60% result in unplanned births, and 16% in miscarriages. • In spite of the country’s highly restrictive abortion law, an estimated 51,500 induced abortions occurred in Senegal in 2012, a rate of 17 abortions per 1,000 women aged 15–44. Virtually all of these procedures were clandestine and unsafe. • Senegal’s abortion rate was lower than the rate in West Africa as a whole (28 per 1,000 in 2008). • The abortion rate was higher in Dakar, the capital city, than in the rest of the country (21 vs. 16 per 1,000). • This difference is likely due to residents of Dakar wanting fewer children and being more motivated to avoid unplanned births than women in other parts of Senegal, and to women from surrounding areas traveling to the capital to obtain abortions and postabortion care services. • Overall, almost two-thirds (63%) of abortions in Senegal are performed by untrained individuals and are considered to be very high risk. An estimated 38% are provided by traditional healers, and 21% are induced by the women themselves. Approximately 4% of abortions are induced using drugs or other substances purchased from a pharmacy. • Just over one-third of abortions are provided by trained health professionals— 17% by doctors and 20% by nurses or midwives. However, since abortion is against the law in virtually all cases, even trained clinicians must work in clandestine environments, which may compromise the safety of the abortions they perform. • The majority of Senegalese women who have an abortion (55%) experience complications that require medical treatment. However, 42% of these women do not receive the care they need. • A woman’s risk of experiencing a complication from her abortion varies substantially according to her income and where she lives. 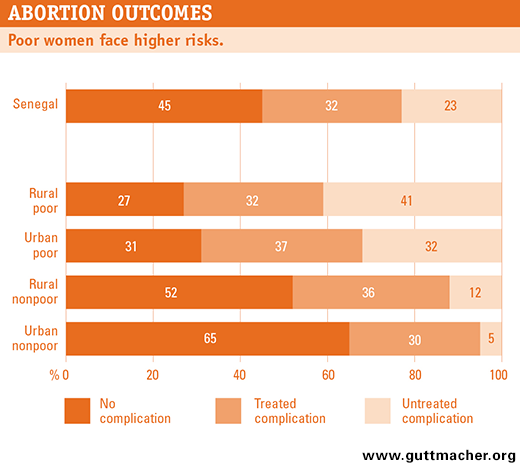 While 73% of poor rural women experience abortion-related complications, only 35% of nonpoor urban women do. • Likewise, treatment for complications is related to place of residence and wealth. About half of poor women with abortion complications—46% in urban areas and 56% in rural areas—do not receive medical attention. In contrast, only 25% of nonpoor rural women and 14% of nonpoor urban women do not receive needed medical care. • Complication rates are highest for abortions that are self-induced (79%) or performed by an untrained provider (71%). They are lowest for abortions performed by a doctor (22%) or by a nurse or midwife (35%). • Health centers, district hospitals and regional hospitals provide the bulk of postabortion care in Senegal. On average, each health center and district hospital treated 143 women for post-abortion complications in 2012, and each regional hospital treated 233 such cases. Health posts (lower-level primary care facilities staffed by nurses and medical assistants) treated an average of 21 women with postabortion complications, and private clinics treated 40. • Although the provision of postabortion care is legal, other research has found that women who arrive at health facilities seeking such care are sometimes reported to law enforcement authorities. • Most abortions are the result of unintended pregnancy. The incidence of unintended pregnancy and unsafe abortion can be reduced if the Ministry of Health continues its efforts to expand and promote family planning programs throughout the country. To be effective, programs should offer high-quality, voluntary services that are affordable and comprehensive, and that include counseling, information and provision of a wide range of contraceptive methods. • There is a need for continued expansion of postabortion care services, for increased availability of relevant supplies and for the training of additional providers to perform these services. Because poor and rural women are the least likely to obtain the medical attention they need, special effort should be paid to increasing postabortion care services at lower-level health facilities (such as health posts) and all facilities in rural areas. • Even where postabortion care services are available and affordable, fear of criminal charges and stigma may prevent many women from seeking the care they need. Educating providers about the legality of postabortion care—and the importance of such care to women’s health—may reduce these barriers to women’s obtaining prompt medical attention for abortion complications. Sedgh G et al., Estimates of the incidence of induced abortion and consequences of unsafe abortion in Senegal, International Perspectives on Sexual and Reproductive Health, 2015, 41(1):11–19; and Agence Nationale de la Statistique et de la Démographie (ANSD) and ICF International, Senegal: Continuous Demographic and Health Survey, 2014, Dakar, Senegal: ANSD; and Rockville, MD, USA: ICF International, 2015 (in French). The publication of this document and the study on which it is based were supported by The William and Flora Hewlett Foundation. *Ces données ont été corrigées le 16 avril 2015.